All 2017 Command Senior Enlisted Leader assignments in the U.S. Armed Forces. Senior Enlisted Leaders are responsible for keeping the commanding officer and/or executive officer informed about issues or developments within the enlisted workforce. Marine Corps Sgt. Maj. Paul G. McKenna, currently assigned as the force sergeant major, U.S. Marine Corps Forces, Pacific, Camp H. M. Smith, Hawaii, has been selected to replace Command Chief Master Sgt. Harold L. Hutchison as the command senior enlisted leader for North American Aerospace Command and U.S. Northern Command, Peterson Air Force Base, Colorado Springs, Colorado. Marine Corps Master Gunnery Sgt. Scott H. Stalker, currently assigned as the Defense Intelligence Agency senior enlisted advisor, Joint Base Anacostia-Bolling, Washington, District of Columbia, has been selected to replace Command Sgt. Maj. David C. Redmon as the command senior enlisted leader for U.S. Cyber Command, Fort George G. Meade, Maryland. Navy Command Master Chief Lateef N. Compton, currently assigned to the U.S. Naval Computer and Telecommunications Station, Naples, Italy, has been selected as the Combined Maritime Forces Coalition senior enlisted leader, Naval Support Activity, Bahrain. Air Force Chief Master Sgt. Richard L. Winegardner Jr., currently assigned as the command chief master sergeant of the 352nd Special Operations Wing, RAF Mildenhall, United Kingdom, has been selected to replace Sgt. Maj. Jeffery T. Stitzel as the J3 operations senior enlisted advisor for U.S. Africa Command, Stuttgart, Germany. 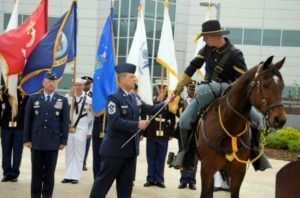 Air Force National Guard Chief Master Sgt. James L. Brown, currently assigned as the Kansas National Guard command senior enlisted leader, Joint Forces Headquarters Kansas, Topeka, Kansas, has been selected to replace Command Master Chief Jeffrey A. Covington as the command senior enlisted leader for Joint Task Force Civil Support, Joint Base Langley-Eustis, Virginia. Marine Corps Master Gunnery Sgt. Terrance L. Meekins, currently assigned to Headquarters Regiment of the 2d Marine Logistics Group, 2d Marine Division, Camp Lejeune, North Carolina, has been selected as headquarters commandant and senior enlisted advisor to the chief of staff, U.S. Strategic Command, Offutt Air Force Base, Nebraska. Navy Command Master Chief Shaun I. Brahmsteadt, currently assigned as the command master chief, Naval Air Systems Command, Patuxent River, Maryland, has been selected to replace Army Command Sgt. Maj. Charles M. Tobin as the command senior enlisted leader for the Defense Logistics Agency, Fort Belvoir, Virginia. Marine Corps Sgt. Maj. Dennis M. Bradley, currently assigned as the sergeant major, 10th Marine Regiment, 2d Marine Division, Camp Lejeune, North Carolina, has been selected to replace Army Command Sgt. Maj. Michael L. Cosper as the command senior enlisted leader for Joint Task Force – Guantanamo Bay, Guantanamo Bay, Cuba. Air Force Chief Master Sgt. Benjamin J. Higginbotham, currently assigned as the command chief, 70th Intelligence, Surveillance and Reconnaissance Wing, Fort Meade, Maryland, has been selected to replace Navy Command Master Chief Petty Officer Geoffrey P. Steffee as the command senior enlisted leader for Combined Joint Task Force – Horn of Africa, Camp Lemonnier, Djibouti.